Concurrent Technologies announces its latest 6U VME board featuring long-life cycle devices to extend the life of existing applications through to the next decade. VP E2x/msd is based on the Intel® Atom™ E3800 processor series offering users a choice: a low power consumption single-core variant or a performance orientated quad-core processor. VP E2x/msd is available in a number of different operating temperature ranges from 0 to +70°C up to -40 to +85°C and will also be available in a rugged conduction cooled variant for extreme environments encountered in military and aerospace applications. For critical embedded applications, VP E2x/msd supports either on-board CFast or Flash disk module options. A facility to mount a 2.5-inch SATA storage device is also offered for applications that need higher capacity local storage. 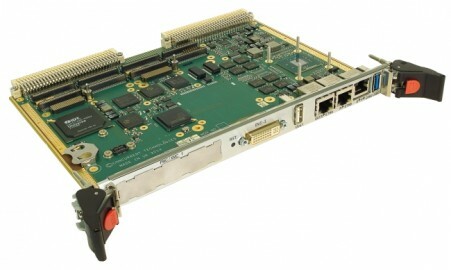 VP E2x/msd is supplied with a board support package for Linux®, Windows® or VxWorks as standard. Other operating systems can be supported based on customer demand as Concurrent Technologies develops and tests all board support packages in house through a dedicated team of engineers producing high quality and responsive support. Additional built-in test and security software options are available to support applications that require them. Jane Annear, Commercial Director for Concurrent Technologies commented “As soon as the End of Life announcement was made for the VME bridge device that we have been using, we moved as speedily as possible to offer our VMEbus customers choices to keep their applications active for years to come. One result is VP E2x/msd that we’re announcing today. It’s functionally very similar to a previous generation board with a range of processor, memory and storage combinations to suit power/performance budgets and with optional PMC/XMC expansion for additional flexibility”. All companies and product names are trademarks of their respective organizations. Intel, and Intel Atom are trademarks of Intel Corporation in the United States and other countries.